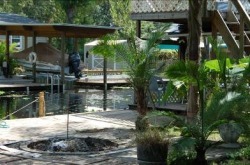 Waterfront cottage for a relaxing get-away vacation or place to stay while seeing the sights in Central Florida. Acorn cottage is on a canal, one block from the St. John’s River. Bring your boat for fishing or cruising the river. Close to Lake George and Silver Glenn Springs by water.